The goal of the CCP (CO2 Capture Project) third phase Certification Framework (CF) project is to develop a simple, transparent, and accepted approach to analyzing leakage risks at CO2 storage sites. It assumes that the main potential leakage pathways are wells and faults. Further, it assumes all of the vulnerable entities reside within a handful of compartments, and that impacts to compartments can be represented by proxy CO2 fluxes and concentrations affecting the compartments. These aspects of the CF are illustrated in the figure on the right. JP Nicot is project PI, and is collaborating with the Petroleum and Geosystems Engineering department at UT and Lawrence Berkeley National Lab. The work started in 2007 and is funded for at least one more year by CCP, a consortium of large companies and governmental entities. The CF approach has already been applied at 5 sites. The modular nature of the project allows for constant improvements and additions to the CF. 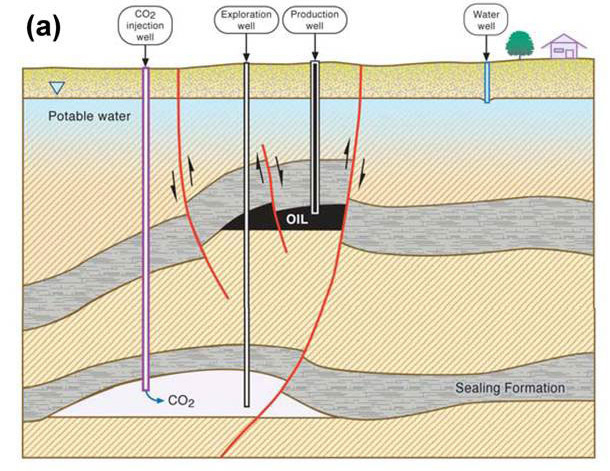 (a) A generic geologic cross section of a potential GCS site showing reservoir and sealing formations, faults, wells, hydrocarbon resources, USDW, and the near-surface and surface environments. 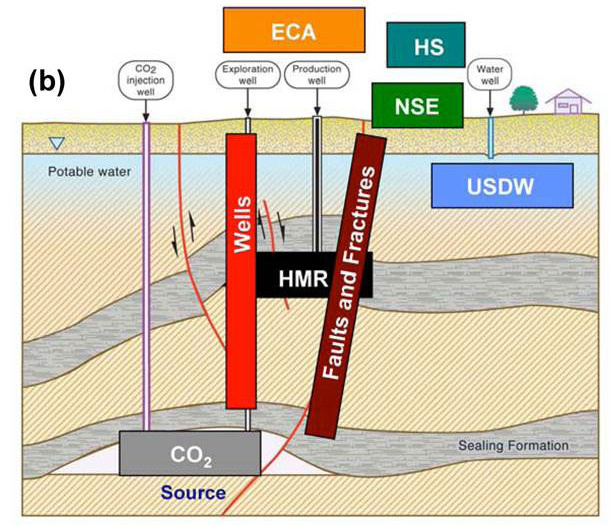 (b) A generic cross section with CO2 source and Hydrocarbon and Mineral Resources (HMR), Near-Surface Environment (NSE), Health and Safety (HS), and Emission Credits and Atmosphere (ECA) compartments overlaid.